Preheat oven to 350 degrees. Pour boiling water over dates. Let cool. Cream shortening and 1 cup sugar in separate bowl. Add eggs and beat well. Sift flour with soda, salt and cocoa. Add flour mixture to shortening mixture alternately with date mixture, adding the dry ingredients first and last. Pour batter into reased 9 x 13 pan. 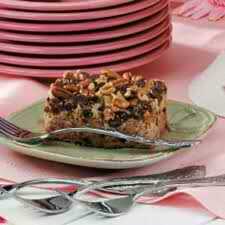 Combine chocolate chips, sugar and chopped nuts, then sprinkle over batter. Bake for 35 minutes. I’m not sure where my mother, Ruth originally got this recipe, but know that this was one of our family’s all-time favorite desserts from our growing up years! Delicious with a large glass of icy cold milk! I printed this recipe and got five pages. Would you please make it possible to click print and get only the recipes?